I’ve decided to run a new series on this blog that will talk you through certain photographs that I have taken and why I love them and my job being a wedding photographer in Kent. This will give you a bit of a sneak peek as to what his going on in my mind before I hit the shutter button at a wedding. This won’t be weekly or fortnightly post. 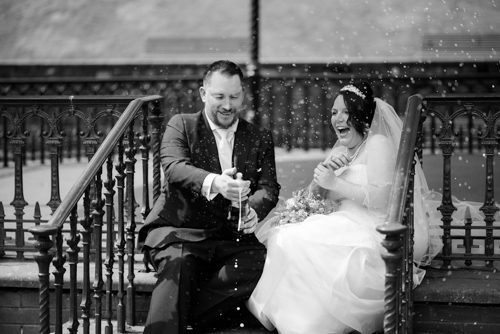 It’ll be as and when I spot a photo that really shows why I love being a Kent wedding photographer. I may be taking photos from weddings in the past or it may be a feature from a wedding just shot. So for part one (of many) I’ve chosen this photograph. Jason and Sarah had a lovely ceremony at a beautiful church, between the ceremony and getting them back to the reception we stopped for 30 minutes or so for some portraits in a local park. The driver of the vintage Ford that Jason and Sarah had hired handed them a bottle of fizz. Jason cracked off the lid, gave it shake and the result is in the photograph above. Cue me getting soaked with the contents of the bottle. However what’s more important is that it made for an awesome picture and one that will have a story to be told when it’s viewed in the future and that is why I love this photo! Moment’s like this pass by so quickly so it’s essential that I’m ready to capture these special moments on your wedding day. If you’re looking for a wedding photographer Kent, then please contact me to discuss your wedding day!